My goodness, this is a lonely spot. Here we are in the narrow lanes north of the A11, which seems to have taken all the traffic from the parishes around here. The villages are small, where they exist at all, mostly straggling thinly along lanes that dogleg and double-back as if in no particular hurry to get anywhere. Snetterton may not have many houses, but it is famous for its racing track, and you may also have come across it as the home of the International League for the Protection of Horses. Their award-winning building and farm sit beside All Saints, the pair in splendid isolation in the rolling fields. They keep the key, but the office is not open on a Saturday or Sunday, so you will need to visit on a weekday. All Saints is redundant, unsurprisingly. 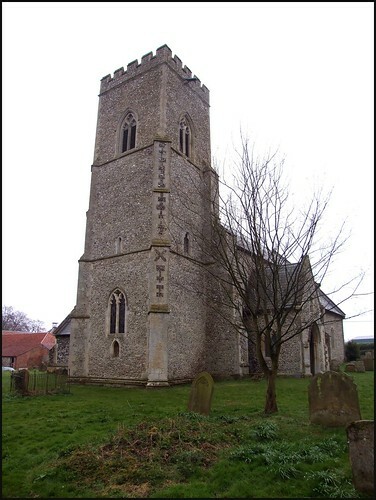 This seems to have been a fairly painful process, the church falling into disuse and then suffering years of vandalism before being rescued by the Norfolk Churches Trust. It was not thought an important enough building for the Churches Conservation Trust to have been asked to take it on, and so it relies on the tender attentions of local people. I had seen some beautiful photographs of the interior on a bright sunny day; it looked endearingly ramshackle, a creamy light filling a wide, empty space. But we came here on a grim March day with a thin, icy drizzle wafting across the graveyard. We got the key, and let ourselves into a church which was even colder than outside. The building was obviously due for a spring clean, and the grey skies outside made the interior rather gloomy. But I liked the air of resilience. This is a big, mostly 14th century church, elaborated with a large north aisle a century later. However, the chancel and the inner doorways of a earlier church survive, and although the chancel is now pretty well all Victorian, the grand double piscina of perhaps 1280 survives. The rood screen is rather sad, with panels kicked out and half the arch broken. Pevsner thought it was all of the 19th century, and that is certainly true of everything above the dado, but some of the carving on the dado itself looks as if it might be medieval. The glass in the east and west windows is good work by the O'Connors. That in the nave is less good; Mortlock says it is by the Covent Garden firm of Cox, Buckley & Son. All you Good People that pass by, Remember Death for you must die. As I am now so you must be, Prepare with speed to follow me.